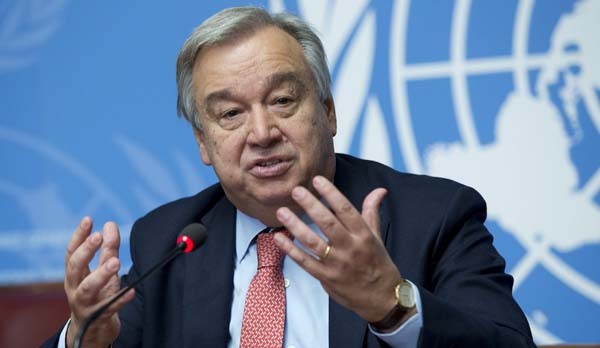 UNITED NATIONS, Mar 21 (APP):United Nations (UN) Secretary-General Antonio Guterres Thursday called on India and Pakistan to “de-escalate the tensions” between them as the two countries’ militaries still remain on alert. “It is imperative that India and Pakistan de-escalate the tensions,” and resolve their differences through engagement, the UN chief’s Deputy Spokesman, Farhan Haq, said in response to a question at the regular noon briefing at UN Headquarters in New York. The spokesman said that the secretary-general stands ready to play a ‘helpful role” in lowering the India-Pakistan tensions. His good offices were available provided the both countries agree to this course.